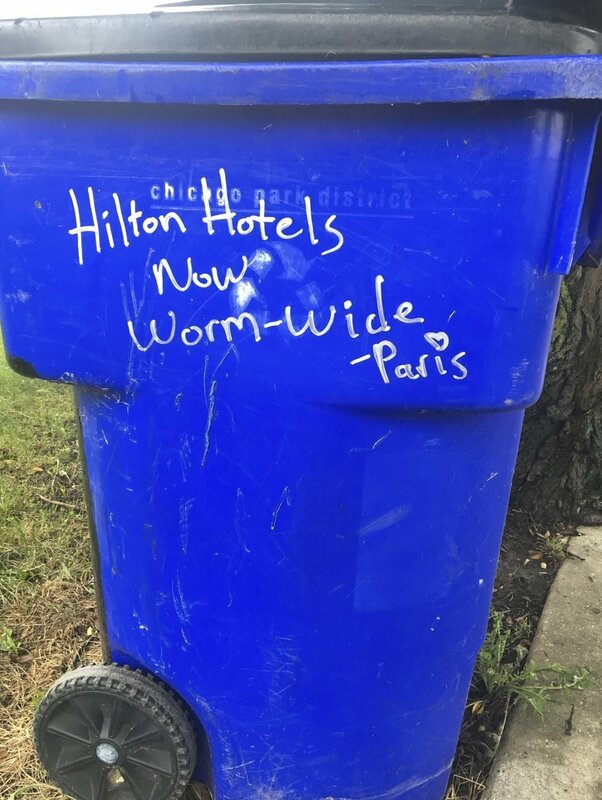 Paris Hilton aka Solaris Hilton aka Jaipur Hilton aka Zachary Swezy has been wandering the streets of Chicago, enhancing back alleys with his signature dumpster art. Always signed off with Paris (a heart to dot the i) and almost always featuring some type of worms, this graffiti project has been fascinating to follow. Now with a PDF collection known as The Paris Review - Collected Worms, Vol. 1 (which you can grab here), I spoke with the unique visionary about his bigger picture, his novel in the works, and, of course, his favorite worm. When did you first start writing on various outdoor objects? I just recently started over the summer of 2018. I had done one tag before that, it was a pre-made ratking tag I bought from one of their early shows. You said that this will tie into your novel. Care to elaborate? I'm writing a novel set on a fictional island that is under extreme surveillance, the footage from which is cut into a reality show for the rest of the world - not unlike the premise of The Truman Show but none of the islanders are aware of the reality show, or aware of much in the outside world. Oh, I should mention: the two main characters in the novel are graffiti writers. I appreciate the earthworm so much for aerating the soiling and facilitating plant life on earth, so she's probably my favorite. If you could place your words anywhere in the world (in a public space) where would it be? I'm really fond of writing on garbage receptacles, so ideally if there is a "world's largest trash bin" category in the Guinness World Book thing, I would like to write on that.